When you’re keeping costs in line, it’s great to know you’ve got smart and delicious choices. So turn to INSTANTWHIP® TOPPING when you’re looking for sweet, creamy value – it’s our economical direct replacement for dairy cream. And like all of our products, INSTANTWHIP® TOPPING is delivered fresh to your door by our Route Sales Team who know you, your needs and our products. Order online, with your regular sales contact or even with a phone call – whatever is most convenient for you. 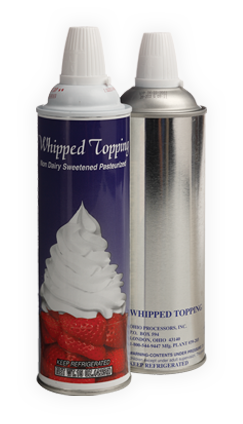 NSTANTWHIP® TOPPING is a smart blend of old- fashioned cream-like taste that’s as economical as it is delicious. The taste is fresh and rich, and with our modern containers you will get the consistency and yield you need – without dispensing frozen or partially frozen product. It is great in dozens of applications throughout a food service business. Use on drinks like hot chocolate and Irish Coffee. Give a special, economical flair to desserts like gelatins, pies and puddings. Add to the breakfast menu for items such as waffles and pancakes.